“Lo aaya aaya aaya main hoon movie madaari / Laaya chalti phirti tasveero ki kyaari / Har kahaani, ek kahaani nayi si pyaari / Arrey, kissa hai cinema ke jaadu ka / …Sau sau baras ka hua, yeh khiladi na boodha hua…” Half the battle for Bombay Talkies is won when it starts with these evocative words from the song Akkad bakkad by Swanand Kirkire, set to a lilting tune by Amit Trivedi and sung by the always wonderful Mohit Chauhan. It’s beautiful. Quite rightly then, teased by the promise offered by these lyrics, you’d be justified in expecting four short stories paying tribute in some way to 100 years of Indian – or at least Hindi – cinema. It turns out that the link to cinema is tenuous in at least one of the segments, but that’s the least of the problems in this cinematic anthology that doesn’t quite deliver the goods, despite charming elements scattered throughout. In Karan Johar’s story, Rani Mukerji and Randeep Hooda play urbanites Gayatri and Dev, whose humdrum marriage is disrupted by the entry of Gayatri’s young, openly gay colleague Avinash (Saqib Saleem). Rani delivers a sparkling performance as a woman masking her unhappiness with a sunny disposition. Her prettiness despite the minimal makeup is a bonus. It’s also nice to see how hot Randeep looks as an older man. The film has other interesting touches – a man is surprised that his wife’s “friend” from work is not a woman. And a major milestone has been crossed with the usually homophobic Censors clearing a full-on, mouth-to-mouth, man-to-man kiss (FYI there’s solid chemistry between the gentlemen in question). The lack of squeamishness about homosexuality in this short is unexpected, considering that KJo has sometimes been slammed for caricaturing the gay community in his productions Kal Ho Naa Ho and Dostana. But there’s a trying-too-hard-to-be-cool air to Avinash’s brazenness at office. As an intern at a tabloid, when he meets his boss for the first time, he notices her roving eye and asks snidely: “Galey mein mangalsutra, aankhon mein Kama Sutra?” Media houses tend to be more relaxed than most Indian workplaces, but a newbie would at the very least raise eyebrows for such over-familiarity. Not here. Instead, when the lady wonders how long he might last in the job, he shoots back a cheap crack about how he lasts veeeery long; and they soon become friends! Sexual harassment at workplaces is a reality, but it’s disturbing when a film positions such comments to a female colleague as cool! In fact, Avinash’s characterisation is the film’s undoing. His motivations for his final actions are inexplicable considering that he seems genuinely fond of Gayatri. Still, this is KJo sans the frothy glamour of Student of the Year; this is one of Bollywood’s most commercially successful directors exploring a gay theme with uncharacteristic frankness. As we mark a century of Indian cinema, that in itself is worth celebrating. Dibakar Banerjee’s short (based on a story by Satyajit Ray) is about a once-aspiring actor who is so washed out that he struggles to make up bedtime tales for his daughter…until he strays on to a film set one day. Nawazuddin Siddiqui as the protagonist shines when he’s on that set. In an interesting scene elsewhere, he washes clothes at the community taps in his chawl, interacting with ease with the ladies of the complex. Gender stereotyping is turned on its head without a sermon. This is the most accomplished tale of the quartet, followed by KJo’s film. Next is Zoya Akhtar’s story about a little boy who longs to be a dancer. He can’t confess his ambitions to his tyrannical father (Ranvir Shorey) who has fixed notions about the professions men must take up. The secondary theme is of a man who openly discriminates between his son and daughter. No doubt this is a well-intentioned film but considering the prejudices male dancers already face, that scene in which the little boy cross-dresses may end up perpetuating more stereotypes than busting them. Much better handled is the message about following your dreams that comes to the child from his favourite movie star. The highlight of this short is the bond between the siblings, played excellently by Naman Jain from Chillar Party and TV actress Khushi Dubey who is a complete natural before the camera. Bringing up the rear in Bombay Talkies is Anurag Kashyap’s story of an Allahabadi man sent off to Mumbai by his father to feed home-made murabba to Amitabh Bachchan. Vineet Kumar Singh brings a likeable earthiness to the central role, capturing a dutiful son’s desperation well. The camerawork gives the film a natural feel. There’s also some humour and pathos in the goings-on outside Bachchan’s house. But the film wanders and seems pointless beyond a point. So as it turns out, each segment of Bombay Talkies is attractive in parts, but none is as completely riveting as Kashyap’s earlier short film Pramod Bhai 23 (from Mumbai Cutting, a so-far-unreleased omnibus volume of shorts by 11 Indian directors), or Santosh Sivan’s extraordinarily moving Kannada short film starring Prabhu Deva and B. Saroja Devi that was part of Mira Nair’s AIDS Jaago compilation. Worse, the film ends with an unimaginatively directed, boring song featuring a string of reigning Hindi film stars, that sorely misses the energy and sizzle Farah Khan brought to the Deewangi number in Om Shanti Om. 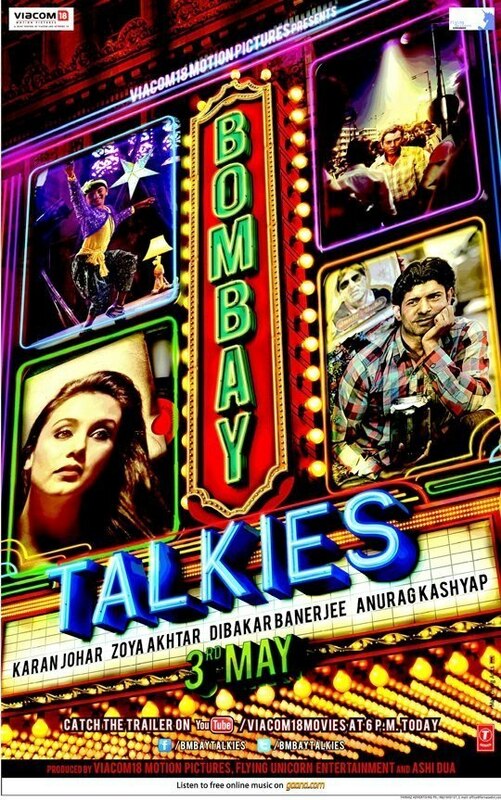 Bombay Talkies boasts of several talented actors and many worthwhile moments – moments of laughter, courage and poignance. It just doesn’t have the jaadu that the movie madaari promised. Oh Anna, Kjo's film was just appalling! He may not have shown a gay character as someone to laugh at, but this is taking away from one stereotype to another stereotype - Gay as stalker, as husband snatcher, as closeted, as repressed, as violent, lunatic, the list is endless. Why can't a gay man ever be shown to just a regular honest tax-paying guy? Why does it always have to be one extreme or the other? While the other 3 revolved around a facet of cinema, I found Karan Johar's movie hugely out of place, predictable and not so appealing. Dibakar Banerjee's movie seemed to be incomplete. I was amazed when I thought Zoya Akhtar's movie is about the sensitive topic of transgenders, it turned out to be a milder version of that. The kids were amazing but this one too felt incomplete. It still had its heart in the right place. Anurag Kashyap's movie was strangely moving and the actor did a decent job. All in all I enjoyed watching the movie but something felt amiss throughout..